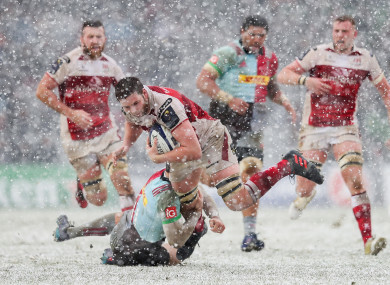 A PRECIOUS AWAY victory has breathed new life into Ulster’s faltering Champions Cup campaign as they produced an enterprising and thoroughly professional performance to get the better of Harlequins and the wintery conditions at the Twickenham Stoop. Man of the match John Cooney kicked four penalties and Jacob Stockdale marked his return to an Ulster jersey with a second European try as Les Kiss’ side leapfrogged Wasps into second in Pool 1. With snow falling throughout the game, it was always going to be a scrappy and disjointed contest but the visitors were superb in defence and they came out on top in nearly every facet. Ulster were full value for a victory which keeps them in the hunt in Europe ahead of next Friday’s return leg at Kingspan Stadium and were led by Iain Henderson with Cooney, Stockdale and Charles Piutau all influential, although the latter butchered a gilt-edge try-scoring opportunity in the second period. The opening quarter was riddled with mistakes as both sides struggled to adapt to the conditions, but Cooney got Ulster up and running from the tee after six minutes as they enjoyed some early dominance at the set-piece. That was to continue throughout the game as the visitors got the better of Harlequins around the fringes and although Cooney missed a second penalty attempt after 19 minutes, he created the opening for the breakthrough try. The scrum-half showed electric pace to burst clear of the ‘Quins defence with a 35 metre run, and a couple of phases later, Stockdale managed to duck under the bodies in the corner. Cooney missed the conversion, but Ulster led 8-0 at the break. A response from the hosts was inevitable, and they pummelled the Ulster line for large periods of the second half before Kyle Sinckler eventually broke the visitors’ resistance. But Ulster showed great composure to thwart any ‘Quins comeback and managed to reaffirm their dominance up front to win a series of three penalties which Cooney converted. HARLEQUINS: 15. Mike Brown, 14. Charlie Walker, 13. Alofa Alofa, 12. Jamie Roberts, 11. Tim Visser, 10. Marcus Smith, 9. Danny Care; 1. Joe Marler, 2. Elia Elia, 3. Kyle Sinckler, 4. George Merrick, 5. Charlie Matthews, 6. Renaldo Bothma, 7. Chris Robshaw, 8. Mat Luamanu. Replacements: 16. Dave Ward, 17. Lewis Boyce, 18. Phil Swainston, 19. Dino Lamb, 20. Archie White, 21. Ian Prior, 22. Winston Stanley, 23. Ross Chisholm. ULSTER: 15. Charles Piutau, 14. Craig Gilroy, 13. Tommy Bowe, 12. Stuart McCloskey, 11. Jacob Stockdale, 10. Christian Lealiifano, 9. John Cooney; 1. Callum Black, 2. Rob Herring, 3. Wiehahn Herbst, 4. Alan O’Connor, 5. Kieran Treadwell, 6. Iain Henderson (captain), 7. Sean Reidy, 8. Nick Timoney. Replacements: 16. John Andrew, 17. Andrew Warwick, 18. Ross Kane, 19. Mattie Rea, 20. Chris Henry, 21. Paul Marshall, 22. Peter Nelson, 23. Louis Ludik. Email “Ulster breathe new life into Champions Cup campaign with huge win at a snowy Stoop ”. Feedback on “Ulster breathe new life into Champions Cup campaign with huge win at a snowy Stoop ”.